The elbow-joint is a ginglymus or hinge joint. Three bones form the elbow joint: the humerus of the upper arm, and the paired radius and ulna of the forearm.The elbow is the region surrounding the elbow-joint. Your elbow joint is made up of bone, cartilage, ligaments and fluid. Muscles and tendons help the elbow joint move. When any of these structures is hurt or diseased, you may have problems that could require elbow surgery. Climbers are likely to encounter an elbow injury of some form in their mountaineering career. The elbow joint is the center of articulation between the humerus, bone of the upper arm, and the radius and ulna of the forearm. It is an important joint for range of motion and mobility of the upper extremities. 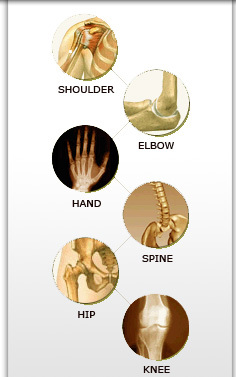 As compared to the wrist and shoulder, the elbow provides less weight bearing activity. Below is an overview of the most common causes of elbow pain likely to be encountered by the mountaineer. This article is intended to be informative and is not a substitute for medical sports medicine evaluation. Other causes of elbow pain include sprains, strains, fractures, dislocations, bursitis and arthritis. 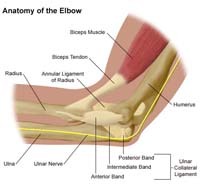 Treatment or elbow surgery depends on the cause.